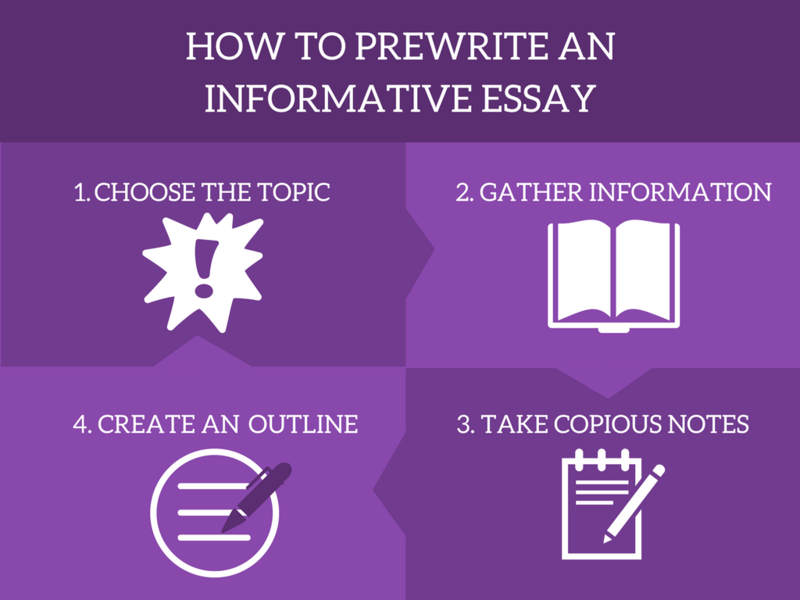 There is no big secret on how to write an informative essay. In fact, you have already written a few during your high school or college career. But if you are looking for advice online, you must be dissatisfied with the grades you have received. So today we’ll share a tried-and-true approach that works like a charm every time. A praise-worthy informative essay should introduce new information to readers, explain its importance, present different points of view, and the latest research, if it is available. After reading your informative essay, a person should have a good grasp of the topic and feel satisfied that you have covered all critical points. To guarantee this result, your work on a paper should start long before you write. The more time you devote to the prewriting stage, the better grade you will get. In case the instructor does not provide you with a topic, you will need to come up with a good subject. An informative essay format allows you to talk about anything you find interesting, like your role model, a historical event, your hobby or favorite sport. The topic should be exciting enough to grab your reader’s attention, not too broad or narrow and easy to research. We have compiled a list of interesting informative essay topics for you. Check it out if you are stuck on the first step of writing a paper. You can choose a topic you know well, but it will turn your assignment into a tedious task. Instead, select a subject that is familiar, but exciting. Use the Internet, library books and journals to collect useful information about the topic. We’ve covered the basics of looking for credible sources and using them in a previous article, check it out if you haven’t already. If you want to learn how to write an informative essay quickly, the secret is in note-taking. When you read and highlight useful information from a dozen of sources, it will soon become a disorganized mess. Looking for the right book or printout will waste precious hours. Instead, use post-it notes to write key phrases and figures from different sources and note the name of the source and the page where you have found the data. Once you have gone through all sources, look at your notes and organize them chronologically or by aspect. Group the post-its thinking about your future informative essay outline; it will make the next step easier. Informative essays follow the same pattern as other academic papers and comprise three parts: introduction, body, and conclusion. And while it’s important to know how to write an informative essay introduction that pops out, at this stage, concentrate on the main body paragraphs. To fit an informative essay format, your paper needs to answer three questions: What, How, and Why. Think of these questions when sorting through your notes and choosing a central idea for each passage. Write them in a text document or on the post-it notes of a different color. Attach the corresponding data from the sources and a final touch of analysis and transition. There are many opinions on how to write an informative essay introduction, but the easiest way is to leave it for last. Once you have composed the paper, it will take you no time to craft a powerful thesis statement. From there you need to check your notes and find the most exciting piece of information about the topic to use as a hook. Add two or three transitional sentences from hook to thesis, and your introduction is ready. If you have followed our advice on note-taking and outlining, writing body paragraphs should give you no trouble. Their number will depend on the assigned volume of the paper and the information you have gathered. Remember to support each claim with evidence and cite the sources. There is no need to repeat the major points of your informative essay in the final paragraph, instead, try linking the topic to your life. Share your take on the problem or provide recommendations for further research in case you couldn’t squeeze all interesting facts into a standard 5-paragraph essay format. Read informative essay conclusion examples to get a better understanding how to write them. When all the Ts are crossed, let your inner critic loose on the informative paper. Do not submit your first draft to a teacher even if you are short on time. Find an hour or two to reread the paper and ensure you have presented the information logically and concisely. Use specialized software or web services to check for grammar and spelling mistakes, or ask a friend to proofread the essay for you. Only once you are 100% sure you did your best, can you submit the paper to your professor and await the verdict. Now you know how to write an informative essay to get the highest grade. If you have questions left, use our paper database to find informative essay conclusion examples and get inspired. Even if the paper is due tomorrow, not all hope is lost. Reach out to our professional writers, and they will help you finish this assignment in time. Using their writing samples and the tricks you have learned today, you will rock the next informative essay.